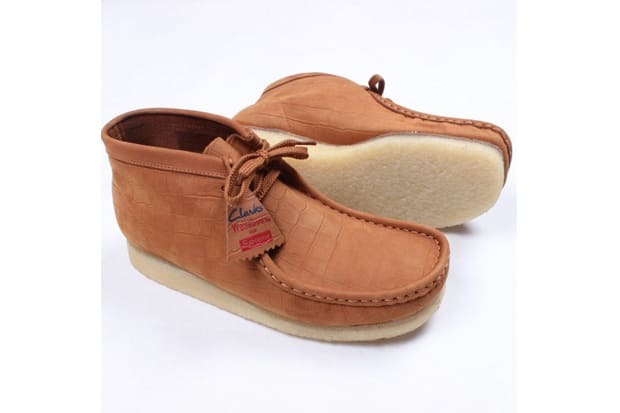 Clarks Originals and Supreme team up once again and have us wanting crepe sole shoes for fall. The wallabee is a shoe any private school kid was forced to wear to because sneakers weren&apos;t allowed, and the shoe that other kids wanted to wear because it&apos;s comfortable, cool, and a classic. The nubuck leather is embossed with crocodile print, and for now, we only see the cognac colorway. Everybody haffi ask when these come out—word to Vybz Kartel.